Something tells me that the state plows are going to soon have a similar message on their plows, too, regardless of who is elected our next governor. i’m a Christian but I agree, putting this on a city snow plow is just insane. the snow plows should all play the national anthem, so we can stand as they drive by. You guys marginalize yourselves when you complain about something as petty as this. 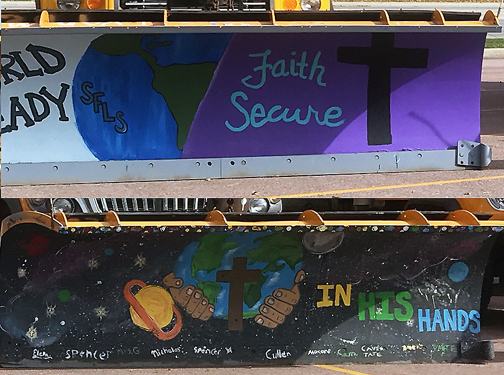 It’s a fun kids activity where they get to paint a snow plow blade. Half the paint will be gone after the first couple of times they’re used. Nobody’s rights are being infringed because some grade school students put a cross on a plow. Is this reference Jesus or Allah. Either way, doesn’t belong on snowplows. How about charge a million and paint them ‘Noem for Governor’? I am a Christian too, and I think it’s insane to do this as well. It is also insane, or inappropriate, to ask people to vote for you, because you are a Christian, too. MP, this isn’t about the kids or being offended. This is a matter of what we believe in in a Democratic Society. Government owned property cannot be used to promote A religion, any religion, not just Christianity. The Cross is the universal symbol of Christianity, the use of it on government owned property is against what we believe in when it comes to equality in our country. One of these days the ACLU will pull their heads out and sue the city over this. Everyone should check out the South Dakota Republican Party Platform. In that platform, the Republicans mention a need to adhere to the Christian-Judeo tradition or ethic, but then a paragraph later they make mention of their support for religious freedom. Now, I don’t know about you, but last I checked, Christians and Jews were not the only religions on earth. In fact, some prisoners belong to the Pizza Religion so that they can have free pizza on Sundays. So any how, our Republicans friends are either very phony, else they are complete idiots…. I can’t wait for the Muslim kids to come paint crescents and Arabic slogans on our public plows. Hey, there is a new Hindu Center in Tea, South Dakota, too. I know it is not Sioux Falls, but part of Sioux Falls is in the Tea School District, however. So I think our Mayor should invite some children of the Hindu faith to paint away….. I could care less if there was a Muslim crescent or a Jewish star on a plow blade. Nobody looks at them and the paint comes off right away anyway. It’s just a fun school activity. Don’t ruin it over some theoretical argument about church and state. The constitution says Congress can’t make a law endorsing a state religion. It doesn’t say that children that attend private school can’t express their religious beliefs in art. MP- Stop making this about the kids. It’s a Constitutional argument, and that argument has already been settled over 200 years ago. You are correct. They can paint crosses all over their school or their parents cars. They just can’t do it on government property.